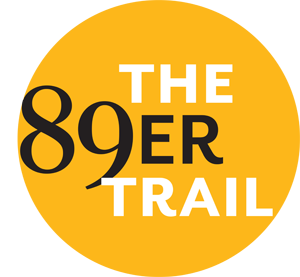 The '89er Trail is funded by private donations to the '89er Trail Fund at the Oklahoma City Community Foundation. Charles E. Wiggin is President and CEO of Wiggin Properties, a commercial real estate firm he founded in 1981. He has played leadership roles in many of Oklahoma City's civic and cultural organizations, including Downtown OKC Inc, the Rotary Club of Oklahoma City, the OKC Museum of Art, the OKC Philharmonic, the Civic Center Foundation, and the Friends of the Oklahoma History Center. A past director of the Harvard Alumni Association, he served for 20 years as Oklahoma's Honorary Consul for the Federal Republic of Germany. Michael J. Hightower is an independent historian whose fields of interest include the American frontier and the history of banking and commerce. Combining the methods of history (documentary research) and sociology (sampling, interviewing, and content analysis), Hightower has authored numerous articles and four books pertaining to banking and commercial history. He is currently at work on a book entitled 1889: The Boomer Movement, the Land Run, and Early Oklahoma City. Bob Blackburn has served as Executive Director of the Oklahoma Historical Society since 1999. He has written or coauthored two dozen books and numerous journal articles, and has served on many national and regional boards and committees, including the Western History Association, the Oklahoma Association of Professional Historians, the AIA, and Leadership Oklahoma City. Larry Johnson is a Special Collections Manager for Oklahoma County's Metropolitan Library System, where he maintains the Oklahoma Room and the digital history collections. He is the author of five books, including Historic Photos of Oklahoma City, and annotated the republication of Albert McRill's And Satan Came Also: An Inside Story of a City's Social and Political History. Anne Hodges Morgan is a nationally recognized consultant who specializes in working with foundations, trusts, and not for-profit organizations. She has worked in the foundation and not-for-profit field for the last three decades and is currently a trustee of the Kirkpatrick Foundation, the Kirkpatrick Family Fund, and the Linda Pace Foundation. A professional historian and writer, she has written and edited numerous books and articles, including Oklahoma, a History, co-authored with her late husband H. Wayne Morgan.